Myths are a very special kind of story. Expressing recurring archetypal themes, they speak straight to the heart about shared human experience. Myths associated with your natal sun sign offer significant insight into the archetypal themes playing prominently in your life. They allow you not only to get a handle on your personal dilemmas, but also provide a chance to find new meaning in your daily struggles. This one’s for Sagittarius. Happy birthday to you. 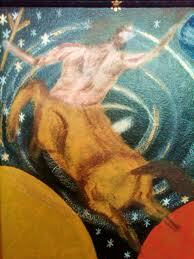 Chiron was the wise king of the centaurs, an ancient breed of wizards and healers; half-man and half-horse. Accidentally wounded in the leg with a poisoned arrow (dipped in the blood of the many-headed Hydra), Chiron tried desperately to heal himself. Although his inspired efforts spurred brilliant advances in science and medicine, he was unsuccessful in his primary task. Because he was half mortal, Chiron suffered unbearable agony. Because he was half immortal, Chiron was unable to die. Finally, Chiron exchanged his life for that of Prometheus who, in punishment for stealing fire to benefit mankind, had been left chained on the mountainside by the angry gods. For his sacrifice, Chiron was honoured with a place in the constellation Sagittarius. Sagittarius is the archetype of the philosopher who through expansion of his physical, intellectual, and geographical boundaries seeks something greater than himself. Even, if like Chiron, Sagittarius never quite reaches his goal, he brings to his fellow men and women, the precious gift of hope.